Bingo is a ton of fun for the contestants! 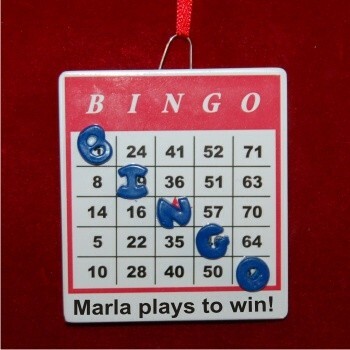 The bingo personalized Christmas ornament is perfect for the gal who takes it seriously, playing multiple cards while ready to let loose with a hearty shout of "BINGO!" There's room at the bottom where shown to add the custom message you compose, which a lettering artist will do by hand in an attractive font different than the one shown for clarity. These hobby ornaments personalized to commemorate the fun and excitement are affordable enough to have one made up for each of your bingo-playing pals. 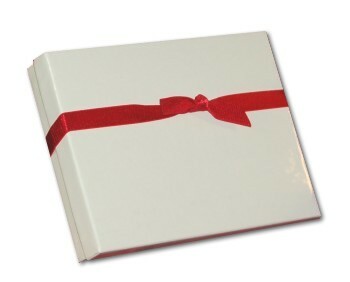 The bingo card personalized Christmas ornament arrives in our classic velvet drawstring bag.